OFFERED IN SUPERB CONDITION THROUGHOUT AND WITH NO UPPER CHAIN. Built approx 4 years ago to a high standard and comprising. Downstairs cloakroom, SPACIOUS LOUNGE WITH BAY WINDOW. LUXURY KITCHEN DINING ROOM. THREE GENEROUS BEDROOMS, MASTER WITH ENSUITE. LUXURY BATHROOM. Enclosed walled gardens. GARAGE AND DRIVEWAY. Situated on the outskirts of Hemel within easy reach of Redbourne and the M1. WE HOLD THE KEYS. Double glazed front door, opens to the entrance hall, stairs to the first floor, recessed spot lighting, coving to the ceiling, radiator, cloaks cupboard. A two piece suite comprising low level WC, wash hand basin, tiled splash backs, extractor fan, tiled flooring. 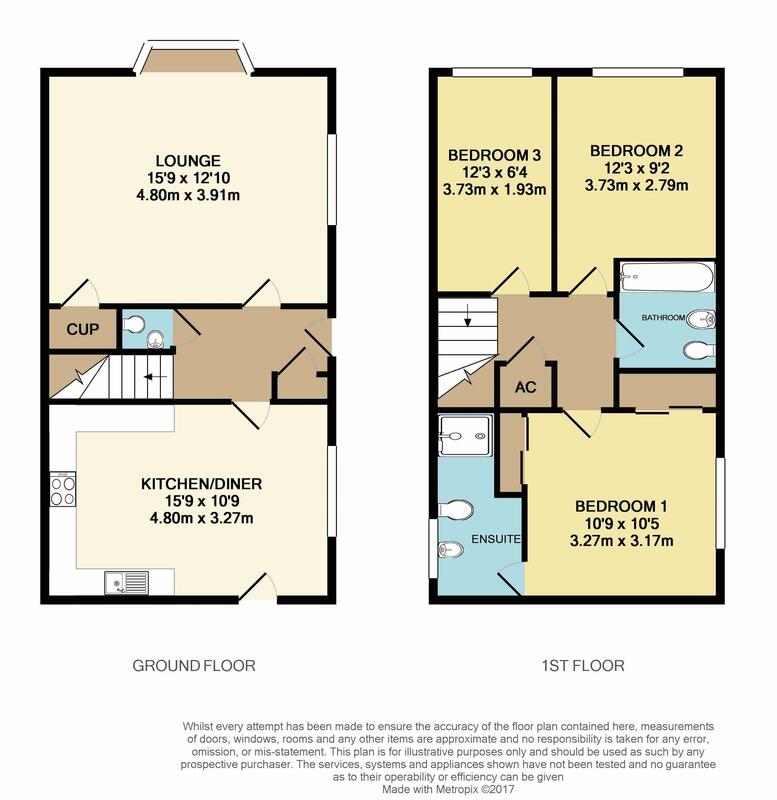 A spacious dual aspect room with walk in double glazed bay window to the side and double glazed window to the front, two radiators, TV point, under stairs storage cupboard, coving to the ceiling. Fitted to a high standard and comprising 1u00bd bowl single drainer stainless steel sink unit and a range of base and eye level storage units pan drawers and wine rack, colour co-ordinated roll top work surfaces, integrated AEG stainless steel oven and grill, integrated stainless steel AEG 4 burner gas hob with stainless steel splash back and stainless steel extractor hood over. Integrated dishwasher, wall mounted gas boiler behind matching cupboard front. Colour co-ordinated tiled floor,dual aspect with double glazed window to front and side aspects. double glazed panelled door to rear garden, 2 radiators, recessed ceiling lighting. Stairs rise and turn to the first floor, airing cupboard, recessed ceiling lighting, coving to the ceiling. Double glazed window to front aspect, 2 mirror fronted double built in wardrobes, access to large loft space via pull down loft ladder with fitted light, radiator, coving to the ceiling. Fitted in white with chrome fittings and comprising enclosed shower cubicle with Aqualisa chrome shower unit, vanity unit with inset wash hand basin and adjacent colour co-ordinated roll top work surfaces to both sides with storage under and low level WC with concealed cistern, colour co-ordinated part tiled walls with feature border tiling, tiled floor. Shaver point, recessed ceiling lighting, radiator, double glazed window to side aspect. Dual aspect double glazed windows to side and front aspects, radiator, coving to the ceiling. Double glazed window to the front, radiator, coving to the ceiling. Fitted in white with chrome fittings and comprising panelled bath with mixer tap and shower attachment, vanity unit with inset wash hand basin with mixer tap and adjacent colour co-ordinated roll top work surfaces to both sides with storage under and low level WC with concealed cistern. Colour co-ordinated part tiled walls with feature border tiling, tiled floor, shaver point, extractor fan, radiator, double glazed window to front aspect. Situated to the rear with up and over door, power and lighting, eaves storage. Driveway providing further off road parking. Arranged with low maintenance in mind with herbaceous and wood chipped borders. Picket iron railings to property`s front and side, outside light. Private enclosed rear garden, laid to patio for ease of maintenance, brick and fenced boundaries. Gated rear access, outside light, outside tap.